I am all about reducing energy use in our home. From installing solar panels, using energy-efficient CFL and LED lighting, switching to more energy-efficient appliances, and driving an electric car, I try to do as much as I can to reduce my family’s use of fossil fuels. The problem now is that I am running out of changes to make in our home. So when I was approached by Power Perfect Place, a distributor of Satic Technology Products to test out some of their new energy-saving technology, I was totally on board. Satic USA offers products to increase electrical efficiency in your home, resulting in a lower monthly electric bill. Their technology is designed to raise the power efficiency of your home (the amount of the power that comes into your home that is put to use rather than wasted), while reducing electro magnetic fields (EMF) exposure. EMFs are invisible areas of energy, often referred to as radiation, that are associated with the use of electrical power and various forms of man-made lighting. Satic’s products reduce energy use and lower EMF radiation by correcting the electrical waves in a home or office system – reducing heat, lowering amperage, and lessening the harmful effects of “electric noise” & negative harmonics that are found in many electrical systems. Here’s more detailed and technical information on how their technology works. Power Perfect Box – Satic’s Power Perfect Box is its flagship product for filtering and conditioning power to provide cleaner energy. A wire-in solution that you install directly at the electrical panel, it provides surge protection, voltage regulation, line conditioning, EMF reduction, harmonics reduction, and energy savings. Cleaner, more efficient power going in to your home or office results in reduced energy consumption and increased equipment longevity. EMF Eliminator – Modern electronics introduce EMF radiation into the electrical circuits in our homes. The result is sometimes referred to as “dirty power” – which results in high EMF levels, electrical inefficiencies and electrical spikes that are potentially damaging to sensitive electronics. The EMF Eliminator is a simple solution that plugs into a standard outlet and filters out harmonics in your electrical circuit to provide cleaner power and reduced EMF radiation. Just two EMF Eliminators (appropriately installed) can produce a healthier and more efficient electrical system for homes and small businesses. This video demonstrates how the EMF Eliminator works. Satic Pulse Light Bulbs – Satic applied their wave-form technology to high quality, energy-efficient lighting. The result is a full spectrum, flicker free light that uses very little electricity and lasts for years – reducing landfill waste and saving money for consumers. The lights come in multiple shapes, colors and sizes, look better, operate cooler, and last for years. Satic Shield – Satic Shield is a radiant barrier insulation that is light weight and easy to install. It is manufactured using a polyethylene foam core with reinforced double sided aluminum facings. It outperforms standard fiberglass insulation to keep things warm in winter and cool in summer – significantly reducing heating and cooling costs in the home or office. I decided that the EMF eliminator boxes were the easiest of the Satic products to install and begin using immediately, so I started with those. I installed as directed by Satic – by simply plugging one in an outlet linked to the “A phase” of my electrical panel, and one in a “B phase” outlet. This is much easier than it sounds, believe me. As you can see, there was a significant reduction in EMF radiation – it was cut almost in half. And while the research on EMF exposure and our health is ongoing (present mainstream science rests on the side of “not a threat to human health”), I figure, hey, reducing EMF exposure is certainly not going to cause harm to our family and may be a step worth considering. In addition to lowering EMF levels, I did notice a slight reduction in my electric bills. A year-to-year comparison of the past two months shows my electrical use down between 5-10%. While I can’t say with 100% certainty that this is directly related to using these boxes, I will say that I have made no other major changes in our electrical use since the same period last year. Now that I’ve seen some results from this technology, I would consider the Power Perfect Box as the next product in my energy-saving arsenal. You can purchase Satic products and get more information online at Power Perfect Place. You can also follow Power Perfect Place on Facebook. Watching my electric bill go down is an ongoing goal. Reducing my carbon footprint, and saving money – it’s a winning combination. Posted in Energy Savings, Uncategorized and tagged EMF, EMR reduction, energy efficiency, Energy Savings, Satic. Bookmark the permalink. You know how you turn to that feature of Us Magazine called “What’s in My Bag?” and you think “yeah, like I really care what’s in Mel B’s bag.” Then, somehow, you find yourself reading the entire article. No, just me? I think we all (well atleast I do) have some curiosity to see inside people’s homes, purses, cars, etc. It’s like a peak into their lives. So, I had this idea to empty out my bag and over-share. Not because I think I’m as interesting as say, Nicki Minaj (thankfully I’m not), but because it helps highlight some of the great green products that I rely on daily. Products that help me live a little more eco-friendly on a daily basis (and none of which I received for free or in exchange for a blog post – just products I love). Organic hand sanitizing spray – Right now, I’m using the Dr. Bronner’s Lavender spray. It’s organic, fair trade, free from harsh and problematic anti-bacterial chemicals, and helps alleviate my OCD hand washing tendencies. Mineral Fusion Powder – this all-in-one mineral powder gives you a daily touch up – especially good for hot sweaty summer days – and provides SPF protection. Its color is subtle enough that I can use it on the whole family, and great to have stored in my purse for those times I realize we headed out to the OC Fair all day without sunscreen (true story). And, it’s free from gluten, parabens, SLS, phthalates, artificial colors and synthetic fragrances. 100% vegetarian and never tested on animals. To-Go Ware – I carry this bamboo utensil set in my bag (which includes a knife, fork, spoon and chopsticks) to avoid single-use plastic utensils. You can see in the photo, I have accidentally thrown away (or others have tossed for me) a few of my bamboo utensils, but I just replaced them with some sturdy plastic ones that I wash and reuse again and again. Bonus: the RePeat carrying case is made from recycled PET plastic. 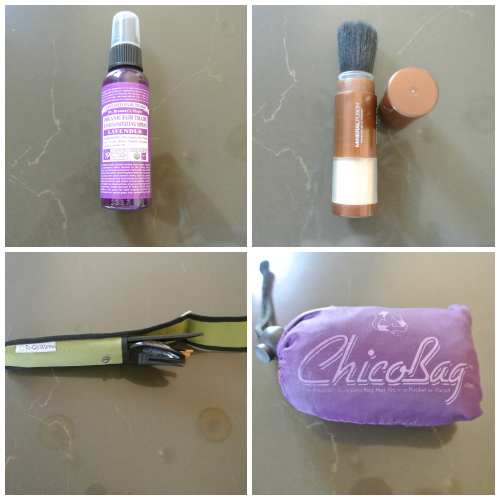 Chico bag – This is saying a lot but seriously, the Chico bag is the single most useful green product I have ever purchased. It is in my purse at all times, so I’m always prepared with my own bag. Not only has it saved me literally hundreds of shopping bags, but it’s also hauled sunscreen and magazines to the beach, sandwiches to a picnic, and even brought home wet swimsuits after a day at the pool. It is durable and super easy to clean – just toss in the washing machine and air dry. Bag of Lip Products – I can’t stand searching in the bottom of my purse for my lip balm, so I keep all these products in a little bag within a bag. Among my favorites are Kiss My Face lip balm, Burt’s Bees Lip gloss, and Vapour Organic Beauty lipstick. With these three products I can go from no color, to subtle color, to night-time color, using safe, all-natural ingredients. Other purse items: My Prius key, iPhone, Coach wallet (which I’ve had for fifteen years and counting), EWG’s Shopper’s Guide to Pesticides in Produce; Bowl of Heaven punch card; Dry Soda coupon; random things like a salt packet from the movies that I didn’t want to throw away and a cork from a champagne bottle opened at a restaurant (which I brought home in my purse to add to my cork collection); a purse hook (no purses on the floor – gross! ); sun-glass-cleaning cloth; and hair bands and bobby pins (which every good dance mom carries at all times). So there’s a look into my not-Us-Magazine-worthy purse. I mean it’s no $3000 Louis Vuitton bag filled with over-priced makeup – just a $100 straw purse full of eco-friendly products I use and love – those that make a green, OCD-tendencied mama’s life easier on a daily basis. 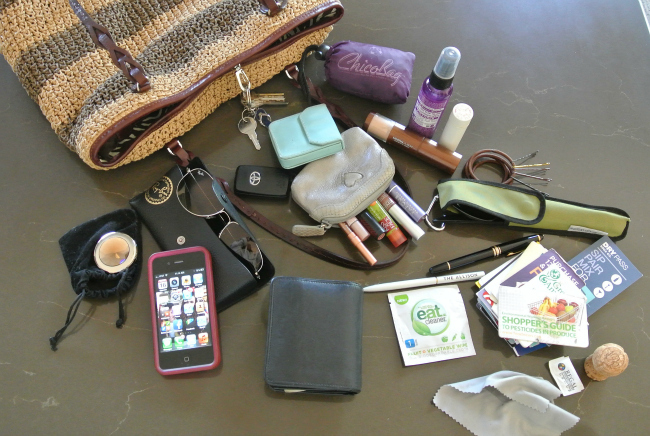 Posted in Uncategorized and tagged bag, beauty, Chico bag, dr bronner, Dr. Bronner's, eco-friendly, green, makeup, mineral fusion, mineral powder, Orange County, purse, To go ware, Us Magazine. Bookmark the permalink. And that, among many, is my problem with my kids being on Instagram. I’ve previously been told that I post too many photos of food, my writing is too “formal”, and generally, I’m just kind of a dork. It really is amazing that I have made it this far in life without them. I mean, how did I do it? Posted in Kids, Uncategorized and tagged advice, Costco, green, instagram, kids, Orange County, organic eggs, packaging, parents, photos. Bookmark the permalink. Do you ever feel like you’ve lost your “ness”? You know, that twinkle in your eye, that spark inside, that thing that makes you, well you. “Ness” is something I borrowed from the movie “You, Me and Dupree”, which is surprisingly touching for a critically-panned comedy. Personally, I love this movie. Owen Wilson is awesome. Here’s the clip where he introduces “ness”. I was talking to my husband the other night, and I told him that I felt like somewhere along the way of life’s ups and downs, my “Allison-ness” got lost. And I’ve been mulling it over in my head ever since. I really want this to be true. If it is, it means my “ness” is in there somewhere, just waiting to be brought back up to the surface – so others can see it’s light. Maybe it was the naivety of youth, but I really did feel that if I worked hard enough, was a good enough person, and had fabulous shoes :), I could do just about anything I put my mind to. But then, things happened on the path of life – it didn’t go according to plans. Over the course of just a few years, life got hard, and sometimes ugly, and sad. 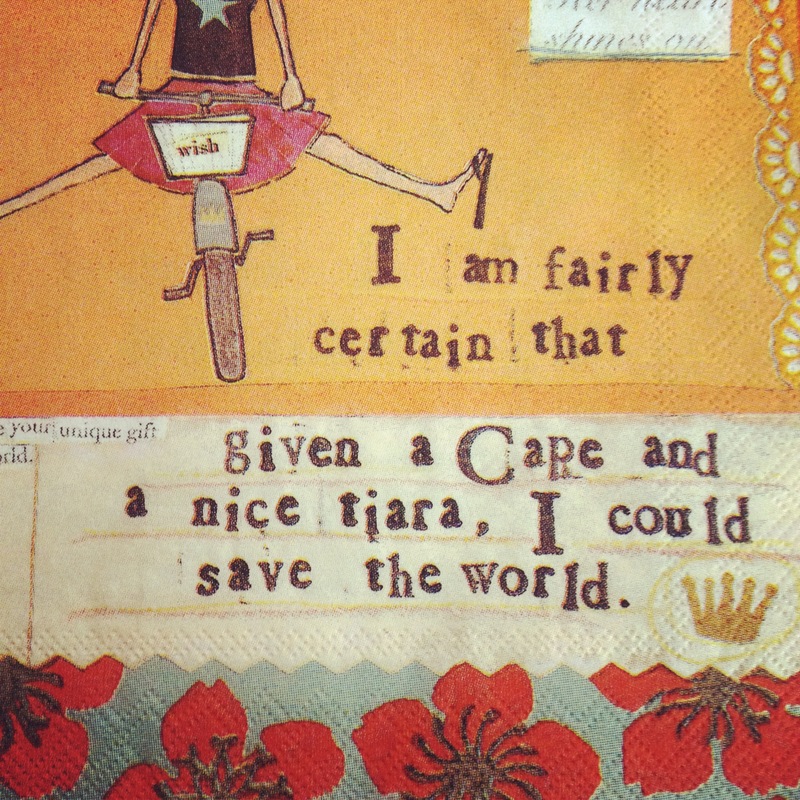 Rather than putting on my cape and fighting the good fight, I found myself tired, distrustful, and overwhelmed much of the time. On too many days, I climbed into my little protective shell and didn’t want to come out. My “ness” climbed in with me, into the safety of the shell. By posting the quote on Facebook, I sparked an enlightening discussion with a good friend. This friend, Randy, was paralyzed in an accident years ago. He offered a different perspective. His accident, he said, caused a loss of not only something that he had, but also something that he was. The discussion was much longer. We messaged back and forth most of the day. It was enlightening, affirming, and a snap-back-to-reality moment for me. Our discussion also made me see this Eckhart Tolle quote in a whole new light. I think it is possible (through the aches, pains, and tragedies of life), to lose something that you are. You can lose it physically, which can lead to a more spiritual loss; or emotionally – like loss of innocence, loss of identity, loss of relentless optimism. Randy’s insight on all of this was invaluable. I am so grateful to him. This the very best thing about Facebook – the ability to connect with some of my favorite people who I no longer get to see regularly. So maybe the answer is that your “ness” is still there. It’s just that, like all of us, it grows up. It doesn’t go away, but rather, changes and adapts to your circumstances and challenges. I think the important thing is that even though it evolves, you must work to keep it shiny and bright, not let it get dulled by pain and loss. That way, your “ness” is a light coming out of you, rather than a darkness sucking in. So I am climbing out of that shell, pulling my grown up “Allison-ness” along with me. It’s needs some buffing. It’s not very shiny yet, but I’m working on it. If your “ness” has been lost along the way as well, I encourage you to find it inside, pull it up, and buff it out. Imagine lots of shiny, positive “nesses” out in the world. Would be an awesome thing. And I will still be trying to inspire change – but maybe instead of the world, the grown-up Allison will settle on inspiring change within a circle of friends. Posted in Uncategorized and tagged Eckhart Tolle quote, growing up, lessons, life, loss, ness, Rush. Bookmark the permalink. I had planned to share a post about recycling today, but on the anniversary of September 11th, it’s hard to focus on writing about much else. The funny thing is that today was just a normal day filled with the regular activities of school and work – nothing out of the ordinary. And unlike last year (when I watched non-stop TV and cried almost the entire day), I didn’t really do much to commemorate the anniversary. The thing that is remarkable to me is that this day was completely unremarkable. Back on this day in 2001, I didn’t think that would ever be the case. After the events of that day, I wasn’t sure if life would ever get back to any sense of normal again. I remember watching TV while nursing my three-month old son. I looked down at his innocent face and thought “My God. What kind of world did I bring you into?” And I just started to sob, and sob, and sob. I felt so sad, so hopeless, so scared. I felt like life as I knew it would never be the same. But then, something remarkable happened. In the days and weeks following that terrible day, we became united. We pulled together in a way that I have never seen before. We picked ourselves up, dusted ourselves off, and started to rebuild…together. All that working together – it actually worked. We did go back to work. We went back to school. We went back to life. And my little baby is now an eleven-year-old boy with a normal, happy life. He feels safe and secure at home, at school, and traveling around this country. He has visited New York City and The Memorial Museum. Although he will never truly understand what that day meant to those who lived through it, he understands the kind of destruction that hate and intolerance can cause. Which gives me hope for his generation, hope for his future, hope for the country. I truly hope that is the case. Although at times it does not feel like that, in the long run, I do believe that it will be. For me, September 11th is a day when we should focus on the UNITED part of the United States of America and look to see how we can strengthen that in our own lives and communities. We will not ever (nor should we) agree – on things like religion, politics, or even which fast food restaurant we will frequent. But in spite of the disagreements, I hope that we still respect, still listen, still love. We can focus on our common goals – healthy children; stable jobs; clean air and water; and a democracy that really does work by and for the people. I want all of these things for me, for you, but most of all for these two. They deserve it, and so do we. 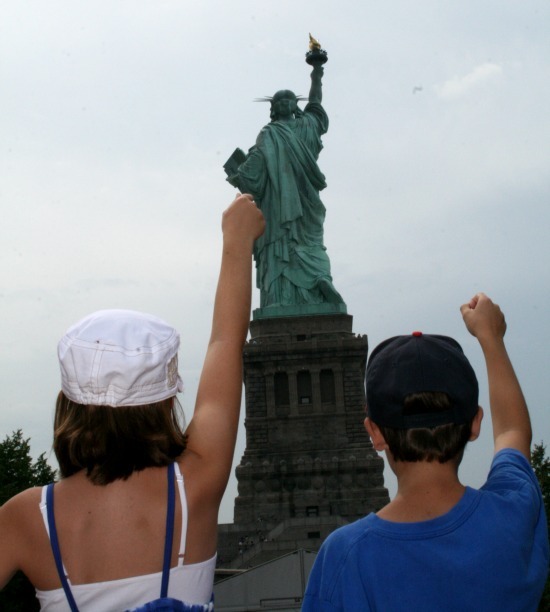 Posted in Uncategorized and tagged green, kids, mom, remembering, September 11th, united, United States of America. Bookmark the permalink.